Neurosurgical Neuropsychology: The Practical Application of Neuropsychology in the Neurosurgical Practice comprehensively explains the use of neuropsychology in neurosurgical settings. The book covers various preoperative techniques that may benefit neurosurgeons, such as functional neuroimaging (fMRI, SPECT, MEG) for presurgical cognitive mapping, as well as more traditional methods to predict outcomes after surgery, including neurocognitive testing and the Wada procedure. The book's editors discuss why neuropsychologists add considerable value to the neurosurgical team. A wide range of patient populations are covered, ranging from Deep Brain Stimulation candidates for Parkinson’s disease, to adult and pediatric epilepsy candidates and neuro-oncology cases. 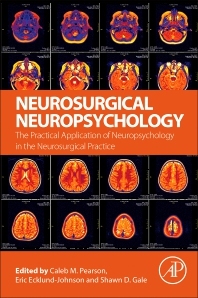 This book is ideal for neurosurgeons, neuropsychologists, neuro-oncologists, epileptologists, general neurologists, and others who want to know more about the use of neuropsychology as a tool in the presurgical and postoperative phases of neurosurgery. Dr. Pearson is an Associate Clinical Professor of Neurology, Neurosurgery and Psychiatry, as well as a Board Certified Clinical Neuropsychologist at The University of Kansas Hospital. His clinical and research interests have focused primarily on the presurgical evaluation of patient's with epilepsy and brain tumors, cognitive outcomes following functional neurosurgery, the use of functional magnetic resonance imaging and diffusion tensor tractography in presurgical planning, and the identification of risk factors related to cognitive decline following neurosurgical interventions. Dr. Ecklund-Johnson is a clinical neuropsychologist in the neuropsychology department at the University of Kansas Hospital and Associate Clinical Professor in the KUMC departments of Neurology and Psychiatry. He is board certified in clinical neuropsychology through the American Board of Professional Psychology and his clinical and research work has focused on cognitive assessment of surgical and non-surgical patients with known or suspected neurological problems including Parkinson's disease, other movement disorders, brain tumors, memory disorders, and traumatic brain injury, among other conditions. Dr. Gale is an Associate Professor at Brigham Young University. His research interests are largely centered in the field of neuropsychology, which is the study of brain-behavior relationships. He utilizes both clinical and research techniques to investigate outcomes following traumatic brain injury and epilepsy.